Rewards:You will earn 1 rewards points for purchasing this item. 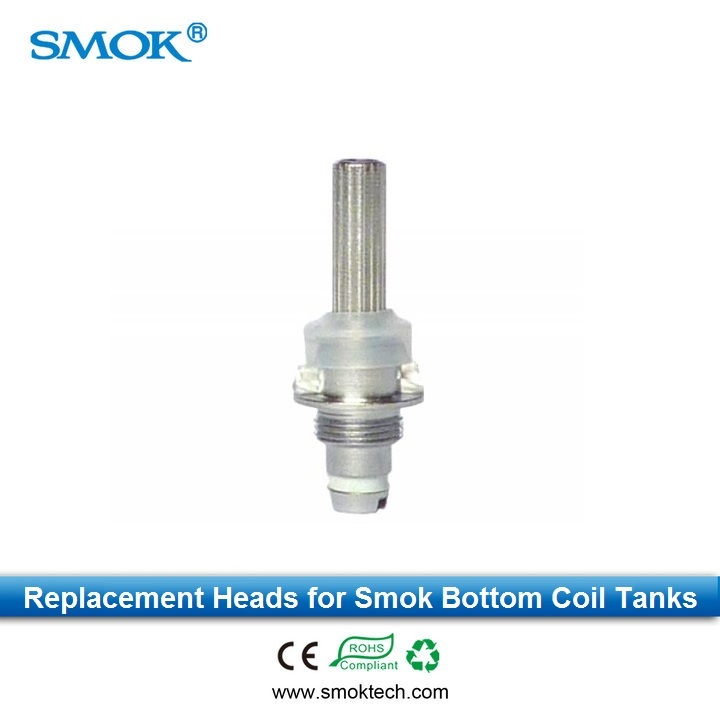 These are the replacement heads for the Smok Tech bottom coil tanks. 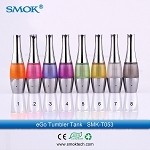 Require assembly into your Smok Tech Bottom Coil Tank. I ordered these for my trophy tank and my trophy tank 2 and they do not last over about two days. I have been very disappointed with the last shipment that I received. Something seems to have changed. Up until the last 6 weeks the bottom coil tank heads would last for over a week. Now they last maybe a day. Very disappointed in them. Bad run at the mfg? We've been using these coils (1.8 ohm) for a while now. It seems that recently the coils aren't lasting as long as they used to. When they came in individual zip lock bags, they would last for two weeks. The ones that arrived in a heat sealed package and/or blister packs have only been lasting a day or two. The 1.8 ohms weren't in stock for my latest order so will try an increase in resistance. Other than the recent lifespan of the coils, they have been great. I have not had the need to replace the coil on my Smok Tech Aro, but I doubt any diference will be found. I recommend Smok Tech over Kangertech. I received my order of the smok tech bottom coils an this is the second time I've gotten them in the blister pack of 5's, I find that these coils are low quality, burn out quickly or just stop working. Love the coils, I keep buying them but don't like having to review the coils every time I buy a set lol so this is my last review on the coils, they are excellent, last a long time and that's why I keep buyin em! Honestly I think Bottom Coil Tank Heads are 100% better than top coils! I have had no problem with dry wick what so ever. They absorb so well and like I said they out last any top coil head I have ever purchased. Most likely I WILL only buy bottom Coil tanks from now on just so I can use them! I use these with a Tumbler Tank on VV Vision Spinner battery. They work really well. Had to play around with the resistence a little to get the right one, but I've found that the 1.8 ohm delivers the best throat hit, heat and vapor for my tastes. These are great. Lowest price that I have found anywhere. Shipping was really fast. Hoosier is the only place I've found to get these essentials for my Trophy and Mini-Trophy Tanks. The service is excellent and the delivery prompt. The flavor is not quite as sharp as with some RBC coils, but it makes it up with these kind lasting much longer! These coils with my variable mah ego battery are unstoppable. Love that they can be cleaned and reused, making it very affordable. 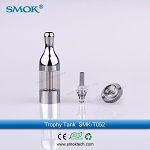 Q: i am getting the trophy tank to replace my pro kanger tank. currently using the 2.5 resistance, what difference do the higher or lower resistance coils make. is the amount of vapor higher with either higher or lower? A: If you are using a non V.V. battery you would want to go with a lower ohm coil to get more vapor with a shorter draw. If you are using a V.V. battery then you would want to use a higher ohm coil so you can apply more voltage and get more vapor. Q: Does this coil head fit only Smok Tech products? I do not know which bottom coil tank head I need for my current device. I have an itazte vv battery. A: No, the Smok Tech heads will fit in the Kanger Evod and Protank 2, as well as all of the Smok Tech bottom coil tanks. If you have an iTaste V.V. I would recommend getting the 2.4ohm replacement coils for whatever tank you decide to use. Q: Do these replace the heads on the Smok GBC tank? A: Yes. These heads will work in the GBC tanks. Q: will thhis replacement heads fit the pyrex aro tanks? A: Yes these are the replacement heads for the pyrex Aro tanks. Q: I am upgrading from a starter kit to a Vision 1300 Spinner with a Pyrex Aro. Which coil is recommended for these items? I have 10+ 1.5 ohm coils to use up, and I don't want them to go to waste, but I realize this is probably not the right coil to be using with the upgrade. A: For the Spiinner you should use the 2.4ohm coil heads. A: No they will not. We will be addind aspire tanks and replacement coils to the website in the next couple days however, so we will have the coils you need available shortly. Q: Will these coils work on the Smok T-Dux 2.0 Pyrex Tank? A: No they will not The T-Dux only takes the T-Dux Heads. Q: Does this come in 2.4 +-2 single coil ? 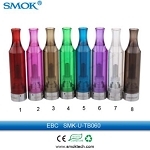 A: All of the bottom coil heads from smok tech are currently single coil heads. Q: I need someone to call me. if you call your number you need a coad for someone to ansure. I would like to place a order. my number is 623-780-8905 thanks mr. early ? A: We spoke on the phone. Q: Will this coil fit the Kanger T3s? A: Yes I believe so, but I really cannot say for sure since we do not carry the T3S tanks.